St. Joseph’s Catholic Academy junior Emma Mallison hammers down a kill in the program’s first-ever trip to the District 6 Class A playoffs. The girls were defeated by the Lady Green Hornets in straight sets. 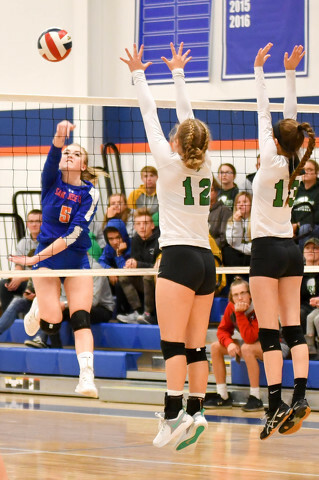 District 6 championships are on the minds of area girls’ volleyball teams this week with the start of the postseason. Bald Eagle Area and Penns Valley began their hunts for a title with quarterfinal wins Oct. 30, and are one win away from facing each other for the district title. The survivors of the district tournament open play in the PIAA championships Tuesday, Nov. 6. BEA, seeking its third district crown in the last five seasons, earned a 25-9, 25-15, 25-17 sweep of Cambria Heights. The team fired in 13 aces, led by five from Elita Brown. Grace Hugar’s 11 kills led the offense, with eight from Taylor Kilmer and seven from Lacee Barnhart. Madison Rockey directed the offense with 32 assists, Lexi Skripek had 14 digs and Katelyn Smitchko and Rockey each posted three blocks. The Lady Eagles (17-0) will host West Shamokin in the semifinals at 7 p.m. Thursday, Nov. 1. Penns Valley (17-2) knocked off Penn Cambria 21-25, 25-23, 25-17, 27-25 for the first postseason win in program history. Emma Butler had a huge night with 17 kills, 14 digs and four aces, and Marissa Stecko added 15 kills and a dozen digs. Bella Culver posted nine kills and 2.5 blocks and Brooke Emel had 40 assists and 15 digs. The Lady Rams also got some solid defensive performances from Cammie Upcraft’s six blocks, and 28 digs to go with two aces for Jadyn Butler. The Lady Rams will host Central Cambria in the other semifinal at 7 p.m. Thursday, Nov. 1. The finals are set for 1 p.m. Saturday, Nov. 3, at Altoona’s Fieldhouse, with both semifinal winners assured of a berth in the PIAA tournament. The district champ will face the third-place team from District 7 (Pittsburgh area) and the runner-up will meet the District 3 (Harrisburg area) champion. Central Cambria advanced to meet the Lady Eagles with a 25-18, 20-25, 22-25, 25-21, 15-10 marathon win over Philipsburg-Osceola on Oct. 29. Kyleigh Kennedy and London Cutler each put down nine kills, Kalista Butler gave out 35 assists, Butler and Cutler each had eight digs and Kamryn Harris delivered 16 service points as the Lady Mounties end the season at 20-12. St. Joseph’s Catholic Academy saw its season end in the opening round Oct. 29 with a 3-0 sweep by Juniata Valley in the first postseason contest in the program’s history. The Wolves finished with an 8-7 record. State College sought its eighth district crown in the last nine season, tangling with Altoona in Tyrone on Oct. 31, after Gazette press time. The winner heads to a PIAA opening round to meet the runner-up from District 7.